I hadn’t bought any doll clothes pattern in quite awhile. I don’t always need to buy patterns, because I enjoy designing my own. However, McCall’s has published some very nice eighteen inch doll clothes patterns recently. I especially liked the fact that the patterns contain some interesting accessories. When Jo Ann Fabric and Crafts put McCall’s patterns on sale last week, I treated myself to several of the new patterns. I usually enjoy reading a good book at bedtime, but a new pattern guide makes a nice change. After I had read all my new pattern guides, it was time to file my new patterns. When I got my pattern box down, it occurred to me that I could share a pattern organizing trick with you. I got the general idea from one of my husband’s aunts and then changed her system slightly. This trick only works for managing patterns for small things like doll clothes. I cut out all of the patterns in one pattern envelope and sort them by outfit. I put the pattern pieces for each outfit in a separate small envelope. I label each envelope with the pattern number, the name of the outfit and numbers of the pattern pieces. All the small envelopes go into the pattern envelope with the pattern guide. 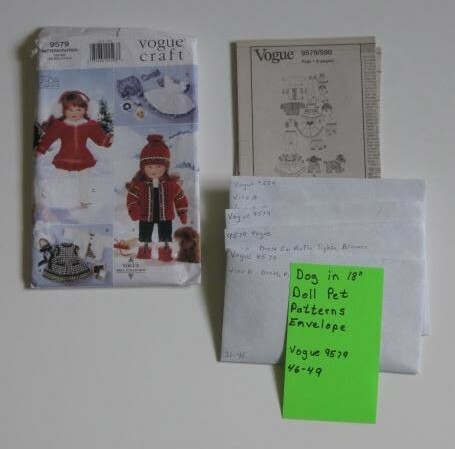 Here is a favorite Vogue pattern that I had organized several years ago. 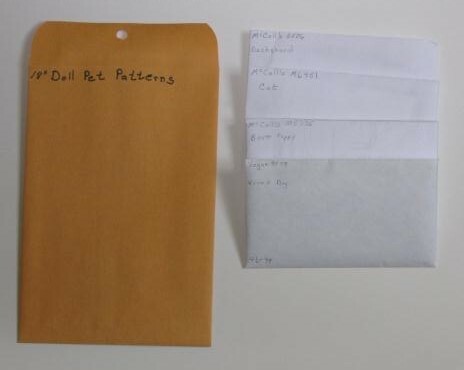 I wanted to remove cat and dog patterns from several envelopes, because I am interested in designing my own doll pet patterns. I want to study the techniques for making small stuffed animals. I labeled a brown envelope and pulled the pet patterns from several different pattern envelopes. I have learned from experience to add an index card to each original pattern envelope to explain what has happened to the missing pattern. 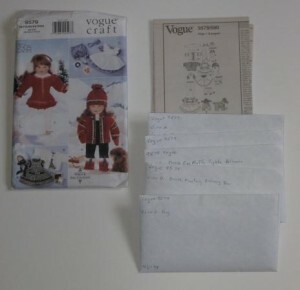 Here is my vogue pattern with the dog pattern removed. Daisy Kingdom makes wonderful fabric. Simplicity Patterns offer Daisy Kingdom patterns. Most of the patterns are for girls’ clothing. Fifteen or so years ago their girls’ patterns included a matching doll dress. 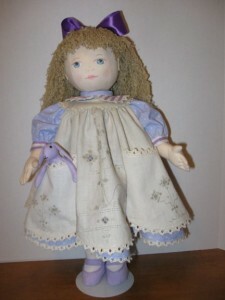 The doll clothes fit the daisy Kingdom doll, Daisy Dolly, which was offered for sale and ready to dress in fabric shops. I’ve had an undressed Daisy Dolly in my closet for some time. While I was making Dutch Doll miniature quilts, I thought of an idea for finally dressing the doll. Here is my interpretation of a dress and pinafore pattern by Susan York. I used the large Dutch Doll on the front panel of the pinafore. I used the small Dutch Doll Printouts on the pinafore pockets. Coming next week: How to win a free pdf of the pattern of your choice. My sister-in-law has inherited stacks of what she calls vintage linens. Earlier this year we looked through some of her stacks to find pieces that I could turn into doll clothing. 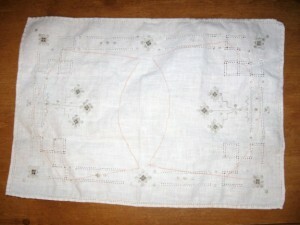 She found a set of table runners that she liked and asked me to make a doll for her guest room using the pieces. It was suppose to be a birthday doll, but I didn’t finish it until Christmas. I designed the 18” doll. I have not yet developed publishable a pattern for the doll. The dress and pinafore pattern was designed by Susan York. Her pattern was published in the Fall 1995 edition of Sew Beautiful Magazine. I have used her pattern many times and have always been happy with the result. The center panel of the pinafore was marked on this piece before it was cut. 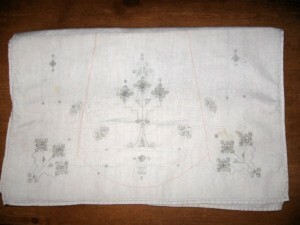 Two pinafore pockets were marked on this piece. Here is the finished doll. She was hiding in the cloth sack that I showed you on December 19.